This paperback republishes the book first marketed in 2016. It is unclear whether the paperback improves in any way the content of the prior publication. The book, the pieces of which have already been published in various peer-reviewed journals, deals with decision-making dynamics in foreign policy, including waging wars. The author, in the acknowledgments section, intimates that the publisher “was willing to gamble” on the publication of a manuscript first written as a doctoral dissertation. The author is pleased with the publisher’s “risk preferences.” It is a bit unnerving to discover that the author perceives a prestigious university press to be acting like a gambler. These hefty supplementary materials were perhaps needed to win the favors of a dissertation committee, but it is unclear whether the general readership, the most probable audience of the paperback, will be interested in combing these academic materials. There is no indication that the manuscript is offered as a sample dissertation for the guidance of students pursuing doctoral degrees in political science. The thesis of the manuscript engages the political science professoriate studying the resolve of leaders in international politics. The book surveys the political literature to discover two dominant themes. It also includes anecdotal statements by U.S. presidents to show the examples of resolve. One theme (say thesis) sees resolve as a character trait of the leader while the other theme (say antithesis) sees resolve as the leader’s willingness to bear the cost of a decision, such as casualties in the battlefield. Pursuing the Hegelian thesis-antithesis-synthesis format, the author concludes that resolve contains both trait and stake components. This synthetic inference, what he calls the interactionist theory of resolve, makes sense and likely appeals to readers’ common sense. However, one wonders whether the author’s synthesis retroactively sets up the thesis and antithesis rather than the other way around. The literature he cites seems to support more the synthesis rather than just the thesis or just the antithesis. In any event, the interactionist configuration of resolve is a better model for understanding state-sponsored decision-making in international relations. Chapter 1, much like a conventional introduction to a book, lays out the main points of the manuscript in easy-to-understand language without tables, graphs, or references to the Boolean values. This is something that could have been published as a booklet for the general readers. In some places, the text is impenetrable. In Chapter 5, for example, consider the following one long sentence: “The absence of microfoundations is problematic because of theoretical underspecification and empirical misspecification: we not only use the concept inconsistently, but we also have difficulty understanding it with observational data, such that we either tend to relegate our favorite independent variable to the error term, or infer it tautologically from the outcomes we are using to explain, thereby turning it into a catchall residual category used ex post to explain otherwise unexplainable conflict outcomes.” After repeated readings even in the context of the chapter, it is hard to fully grasp the sentence. This appraisal does not mean that the author’s style is way out in the left field. Academic writings tend to be dense. (In Europe, academic writings are denser.) I have read hundreds of law review articles (and written some), by law professors for law professors and other legal professionals, which the general readers will find utterly incomprehensible. Yet these articles are precious. However, very few of these technical pieces—some with tables, graphs, and mathematical equations—are printed as books. That is why professional journals in law, medicine, and social sciences are published and favorably viewed by epistemic communities since they facilitate free flow of academic discourse and experimentation executed with intricate methodologies and targeted at relevant professional audiences. 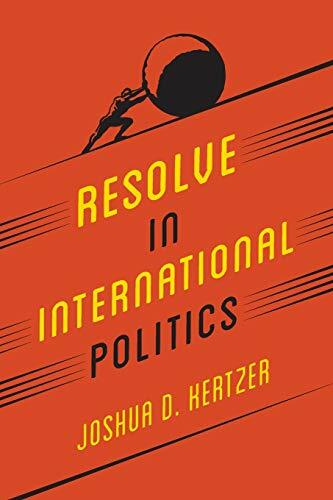 Substantively, the manuscript appears to advance the political discourse on resolve in international politics. The academics praising the manuscript on the book jacket teach at prestigious institutions. One reviewer calls it “a pathbreaking book.” Other calls it “a big step forward.” Maybe, it is. Some of us are highly skeptical of jacket reviews as a species. Some readers might find resolve as a passé notion that belongs to the bygone eras of kings, tyrants, and dictators. The world politics has changed dramatically. Even crown princes and presidents are no longer sovereign the old-fashioned way. The global outrage at the murder of Saudi journalist Khassoggi and the universal scorn for headstrong Trump demonstrate that the leader’s resolve, even under the interactionist model, is no longer a useful concept to analyze, much less to construct, foreign policy. Despite his ironclad resolve, President Trump has failed to make Mexico pay for the wall. For each nation, decision-making in international relations is multifactorial, much more constrained than it has ever been in the past. The rise of asymmetrical warfare has further complicated the notion of resolve. International relations are prone to error because there are too many moving parts beyond any leader’s control. Even though we do not think much of international law in the U.S., most nations and international institutions are constricted by international treaties and customary international law- something the manuscript does not consider. It is also problematic to see, as the author sees, any compulsory relationship between resolve and victory, at the battlefield or in international institutions, such as the World Court or International Criminal Court. The Soviet Union was defeated in Afghanistan. The U.S. has lost cases in the World Trade Organization. The Serbian leaders were prosecuted for their resolve to protect historical Serbia with near-genocidal tactics. Resolve in the clenched fist of a lawless leader is a dangerous weapon. The rule of law weakens such resolves. On the other end, the concept of resolve is meaningless for economically and militarily weaker nations and most nations are poor and weak. Tibet has no chance to assert its resolve against China. Iran, laced with strong leaders, cannot reverse U.S. sanctions. No theory of resolve can empower poor nations to gather more clout in international relations. In fact, the leader’s resolve might attract invasion and assassination, as did Saddam’s in Iraq or Gadhafi’s in Libya. Resolve displays hard work and creativity. It makes sense as a doctoral dissertation or stuff found in professional journals but whether it is a book for general readers (even law professors) is debatable. As a behavioral notion in international relations, resolve outside the international legal framework needs to be shelved away rather than crowned with respect.